Xilisoft ISO Pro, the excellent ISO making and editing software, can make an ISO image from all files on your disk including document, program, and multimedia files like AVI to ISO. Also with the ISO maker, you can open ISO files and edit them, as well as extract ISO files to hard disk. 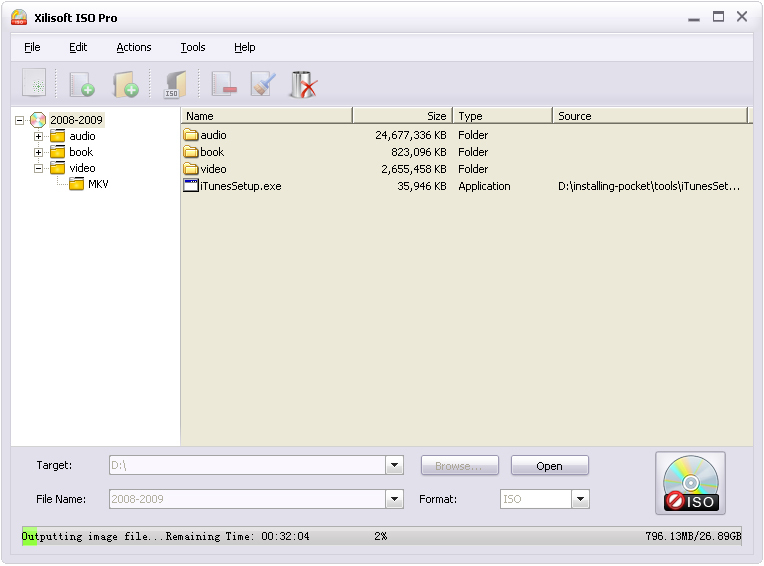 Xilisoft ISO Pro provides optimized storage structure to create ISO images for saving more space. ...... With Xilisoft ISO Pro's friendly interface and all smart features, freely edit and make ISO files right now. Qweas is providing links to Xilisoft ISO Pro 1.0.9.0112 as a courtesy, and makes no representations regarding Xilisoft ISO Pro or any other applications or any information related thereto. Any questions, complaints or claims regarding this application Xilisoft ISO Pro 1.0.9.0112 must be directed to the appropriate software vendor. You may click the publisher link of Xilisoft ISO Pro on the top of this page to get more details about the vendor.